Pressure reducing valves for vacuum steam, with built-in separator & trap. This product is suitable for the vacuum range of steam pressure settings. Accuracy of reducing valve's secondary set pressure is within ± 0.01 MPa. Even if the steam flow (load) to the equipment or the primary pressure at the reducing valve changes, the Shock-absorbing Spherical piston (SAS) supplies steam at a constant pressure in order to maintain the temperature of the steam used as the heating source. 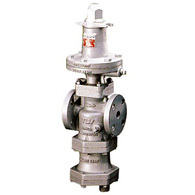 Can be used in a variety of steam heating equipment that supplies steam at temperatures of 100 ºC or less.